The original design of the MACH7 control panel was meant as a direct replacement for a General Electric gas turbine control type. This system is not limited only to General Electric gas turbines, but can also be applied to other manufactures or as a compact unit for the balance of plant equipment. Basically the MACH7 control panel can be applied nearly everywhere. In the standard configuration, all the necessary components for an independent control unit are included. Beginning with easy access for inputting terminal strips, redundant and singular modules for digital and analog input and output module groups, to the S7-400H control unit. The corresponding redundant module implementation has more power supplies and communication modules. For operation and diagnosis, there is a TMOS PC mounted on the control panel door. Being recognized as service specialists in the gas turbine control sector and in process control engineering for General Electric heavy duty Frame 5,6,7 and 9 gas turbines; we were frequently asked if there would be a possibility to provide a modern control system for older General Electric gas turbines. Old electronic components were becoming increasingly expensive and difficult to obtain, causing the control system to become more vulnerable, increasing the maintenance effort and causing the availability to sink drastically. They wanted us to bring a control to the market that conforms to German industry standards, uses standard industrial components, and can be completely integrated in an existing modern structure. Another developmental criterion was that of the spare parts, they wanted these to be available on short notice and come from other spare part storages. For this criteria to be adhered to we use standard components from Siemens without any modification or change, as they are used in the automation industry worldwide. We have invested a lot of time and energy in the control philosophy. We wanted to minimize the retraining process for the maintenance personnel and under all circumstances, follow the safety philosophy of the gas turbine manufacturer. Our MACH7 is the result of the development of many years and is the only available and infinitely tested alternative to the original manufacturer. Today the MACH7 with its modular construction is not only the best alternative for GE gas turbines but also for other brands of gas turbines. A high emphasis was put on standardization for future expansions. The original control system would be dismantled and carefully removed. Then, in the same place, the new MACH7 control system would be mounted and the field cable connected. Whether the original cables are all replaced or simply reused depends on their condition. Parallel to this there can be the addition or modernization of the field devices. All these things are dependent upon the objective of the retrofit. The objective could range from just a simple change to the control panel up to a complete modernization of the entire control system so as to completely automate the system to reach a new operating method. The control panel is a standard unit that can fulfill many other kinds of tasks. This system is not limited to only General Electric gas turbines, but can also be applied to other manufactures or as a compact unit for the balance of plant equipment. 100% digital control and regulation. The only system that follows 100% of the GE gas turbine's control, regulation and safety requirements. Therefore there is no re-learning process for your personnel necessary. Variable fast start for the lowest thermal stress in the minute reserve. MACH7 is the only controller with automatic fast starts, calculated as a function of time remaining in a time window (for the minute power reserved market). This reduces the thermal stress on the turbine hot gas path parts as much as possible. Automated grid re-energization over a large distance. The black start ability and the grid re-energization was demonstrated many times in extensive tests to the full satisfaction of all the parties involved. Fully automatic auxiliary power supply for a large power plant which is located a long distance away. Complete programming and calibration from a remote location. Time stamping to a thousandth of a second for all alarms, events, and measured values. No additional training courses required for personnel experienced with Siemens equipment. Forcing and presetting all inputs, outputs, and variable signals Hardware and Maintenance. Not an original equipment manufacturer solution. All parts that are used conform to German and European standards. Easy access to all terminals. No additional space requirements in comparison with to the old control panel. The MACH7 control panel is a completely independent system and requires no additional components or applications. 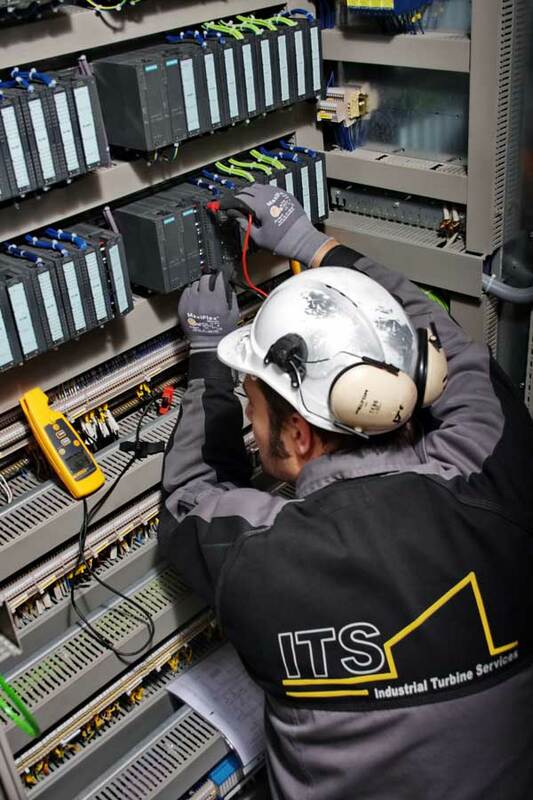 Regardless of what happens to the DCS or other plant communication networks outside of the gas turbine controls (server failure, break in the bus connection, etc.) the control panel remains fully available and operable (the diagnosis functions remain available). Standard Siemens training and a short introduction in the philosophy system, are enough for your maintenance personnel to service the MACH7 safely and effectively. Integration to synchronizer, voltage regulator, generator protection etc.